Trumpeter Peter Evans is to me without question one of the brightest new lights in the free-improv firmament today. He is a fabulous trumpeter. He can go the art of noise route with an incredible array of techniques to extend the instrumental possibilities of his instrument. He can play with the roots of the music in various ways too. 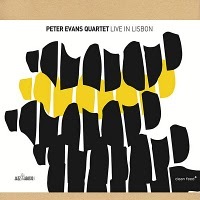 The Peter Evans Quartet Live in Lisbon (Clean Feed 173) gives you the second Mr. Evans. And it is brilliant! Brilliant in conception. Brilliant in execution. It’s Peter and a well equipped quartet that includes Ricardo Gallo, piano, Tom Blancarte, double bass, and Kevin Shea, drums. Much of the performance is a rather amazing go at turning “All the Things You Are” into something quite avant but retaining the harmonic and melodic features of the song as played by countless improvisers from the bop era on. What they do defies easy description. Suffice to say that they fragment the theme and the harmonic base, rhythmically displace it to the point where it’s not displacement, it’s recomposition, and otherwise transform it into something entirely contemporary. And Peter’s trumpet playing must be heard here to be appreciated. It’s one of the most interesting rethinkings of a standard I’ve ever heard. And it does not sound forced. It is one of those CDs that will literally take you someplace NEW. It has the roots, but the tree has a very cool new look. Beautiful performance! !